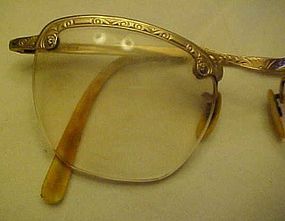 Pretty antiquwd look gold filled frames are waiting your custom lens. Pretty scrolled detailing on the frame browa and along the earpieces. Measures 5" from hinge to hinge. Earpieces a re 4 3/4" total from hinge to extreme tip of earpiece. Nice condition. 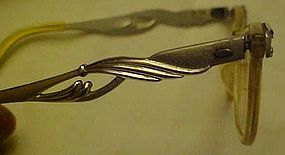 Check out all the other vintage eye wear I have listed. Wonderful retro cateye glasses are all original, in very nice condition, and ready for you to use with your own lens. Fancy metal feather pattern on eye corners, and the arms (earpieces) have a great feather twist cut out pattern. Really nice if you have short hair and can show off this pretty detailing. Original plastic earpiece covers are nice too. email me if you would like to see more pictures. I will be listing several cute cat eye glasses. 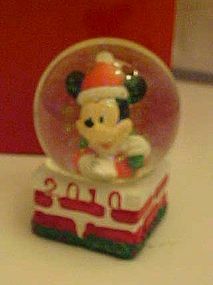 2010 JC Penney little Mickey Mouse snowglobe. 2 1/2" Tall and 1 1/2" Square Base. Never Displayed. New in the box.Sorry.. photo is out of focus. 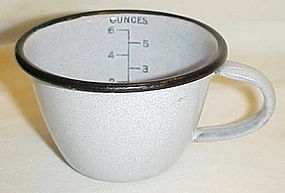 Nice WWI Military Navy graniteware cup with measurement markings inside the cup area - Marked USN - Rare, gorgeous, and a real beauty! Made of heavyweight gray granite with black trim. Measures 2 1/4" tall. Measurements show 1-2-3-4-5-6 ounces. Almost perfect with only a couple of small rubs on the sides, NO CHIPS or dings. An awesome crossover collectible for the Military enthusiast or the collector of graniteware. USN on the bottom. 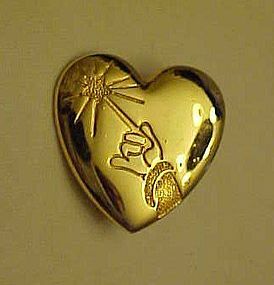 Antiqued gold 3-d clip back earrings NICE!! 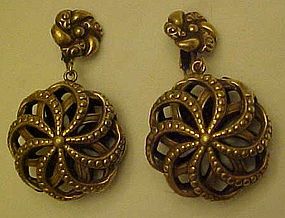 These nice earrings have clip backs and have a nice antiqued gold finish. Three dimensional, with a pinwheel spiral that gives the illusion of a flower The back is exactly like the front and that makes an open space inside the earrings giving it the 3-d appearance, so the look exactly like the front from behind. They have a diameter of 1 3/8". Excellent condition and very well made. I see no makers mark. 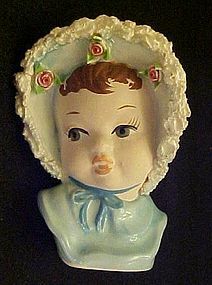 This little vintage head vase measures 3 3/4" tall and is in wonderful condition with no damages at all. Unmarked.Made of ceramic and all but the face area is glazed. Spaghetti trim around her blue bonnet. Tiny little pink applied roses trim. Shes such a sweetie pie. 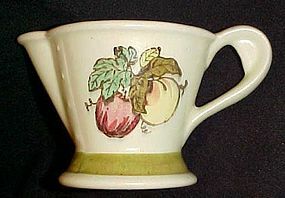 Vintage creamer in the pattern of Golden Fruit from the Poppytrail Collection by Metlox Pottery U.S.A. The pattern is based on off white color pottery with brown and yellow fruit. It is accented with green trim. The footed creamer measures 3 1/4" to the lip. It is in mint condition with no chips, cracks, or crazing. Made from 1961-1970. 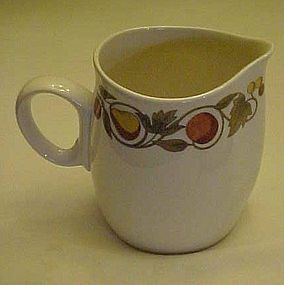 Franciscan creamer in the Pickwick fruit and vine pattern. Holds 10 ounces. Perfect condition with no stains, chips or cracks. Oven safe, Colorfast. Made from 1965-1971. 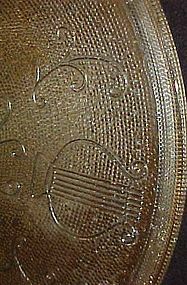 JACKSON CHINA Contemporary PAUL Mc COBB RETRO Vendome DESIGN Restaurant PLATTER. 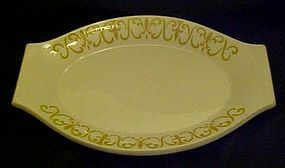 Platter has a retro swirl and fleur di lis design in a mustard yellow color on the outer edge. Made of durable stoneware and is quite solid and heavy. Measures 11 3/4" in length and 8 1/2" at the widest center point. Condition is great, does has some very slight wear marks but no chips or cracks. Date mark T6. Curiosity killed the cat! 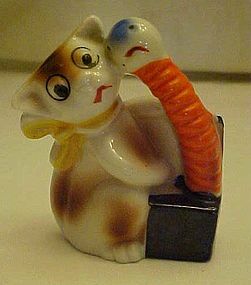 In this case it just punched kitty in the head! This kitty has been caught by surprise with this jack in the box. Figurine is stamped Japan and measures 3" tall. No chips or damages. 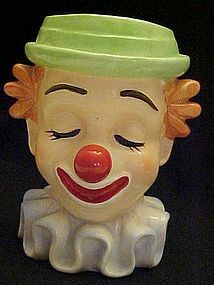 adorable vintage figural planter made of hand painted porcelain with spaghetti trim on the clown. The clown is trying to ride the stubborn mule and is tugging on his ears. Measures 4 5/8" tall and has no chips or cracks. probably is Japanese but the sticker is long gone. Paint is 99% good, as there is a small paint seperation on his pant leg. 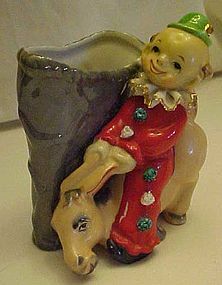 If you collect clowns.. or donkeys.. or just fun old Japanese porcelain, you can't miss with this great vase / planter. Vintage harp lyre pattern cake or dessert pedestal glass plate or server by Jeannette Glass from the1950's. Great condition. with no chips or cracks. Textured finish. Approximately 10" diameter, 4 1/4" high. Great 1950's nostalgic find for cupcakes, desserts, pies, sandwiches, cookies or any other treats. Nice for the holidays. 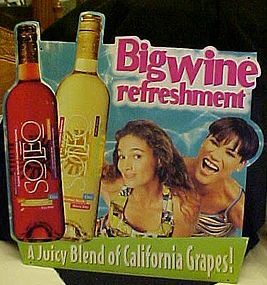 Tin advertising sign for Soleo wines. Design is in relief and graphics are nice and sign is not scratched or dented, and graphics are bright and not faded. Slogan reads: Big wine refreshment A juicy blend of California grapes. One small bend on the lower corner. Factory holes on each corner for hanging. Measures approx 18" x 18". Tin advertising sign for Remy Martin grand Cru cognac. Design is in relief and graphics are nice and sign is not scratched or dented, with exception of a couple of minor dings at two oposite corners. Graphics are bright and not faded. 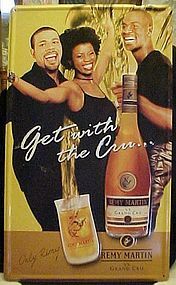 Slogan reads: Get with the cru, and shows 2 black men and a lady having fun at a party and enjoying Remy Grand Cru cognac. One small bend on the edge. Factory holes on each corner for hanging. Measures 14 1/4" x 24". 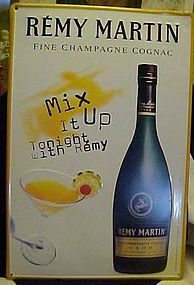 Tin advertising sign for Remy Martin champagne cognac. Design is in relief and graphics are nice and sign is not scratched, and graphics are bright and not faded. a couple of small dents ner the upper right corner on the edge. Factory holes on each corner for hanging. Measures 16 1/2" x 24".